After considerable research, it is clear that teachers have found numerous ways to make the notebook their own in order to have a resource that will meet curricular standards and provide a valuable student learning tool. This blog will present some common components that greatly enhance the Interactive Science Notebook’s (ISN) classroom effectiveness. Rubric – All ISNs have a rubric either inside the front cover or close to the front of the notebook. This is a powerful resource for students and parents since the expectations are clearly written. Some teachers have been known to ask the parent to “grade” one or two assignments in the notebook in order to encourage familiarity with the rubric and the notebooking process. 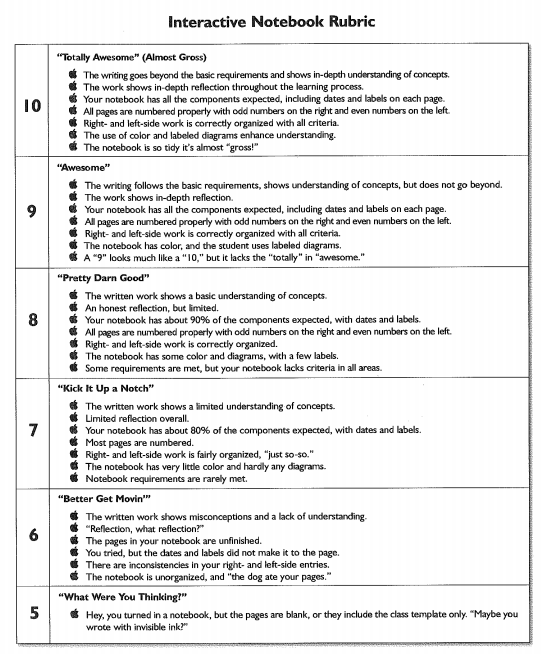 Here are links to an excellent pair of ISN rubrics that you may wish to use or customize. Cover Page – This page is handled in many ways, but the majority of teachers use the cover page to personalize the notebook. On the front cover students often introduce themselves as scientists with images and drawings arranged around their name, grade, and class. This sets the tone of the notebook as a unique personalized journal of the students’ learning. Each unit likewise begins with edge-to-edge colorful pictures or drawings that relate to the topic of study in a personal manner. Table of Contents – The Table of Contents (TOC) can be handled in several ways. The teacher can create a lined chart that students tape into the front pages of the notebook. Teachers may elect to have students leave three or four pages empty to allow space for students to create a personal facsimile. One teacher did a beautiful job on her personal TOC (see example below). Because the TOC is so important, I prefer to have students use a handout that is prepared in advance. Structure of the Notebook – The notebook should be created so that class notes, discussions, lab reports, reflections, and lab activities do not extend beyond the covers of the notebook. To present a great deal of content within the confines of the page foldable graphic organizers, taped extensions which are folded into the page, and other organizational devices are used. It is also helpful to provide an envelope which students attach to the inside back cover for storing worksheets or game pieces for labs or activities currently in process. Page Set Up – The INS uses a unique pagination system. Each set of facing pages is considered one unit. The right-hand page captures input. It’s left-hand companion is for reflections and making connections (see image on right). This set up is based on brain-based research and effective teaching strategies as outlined by Eric Jensen and Renate and Geoffrey Caine. Aha Connection – The Aha Connection page goes by a variety of names… it begins with a “Trigger” assignment that stimulates student generated questions which are synthesized into a single Big Idea or Problem that is recorded. Students add to this page throughout the unit as “lines of evidence” are developed through classroom activities and are recorded as a record of student learning and connections to previous knowledge. This becomes a very colorful and busy page with its many boxes, colors, and post-it notes record of student growth and understanding about the topic (problem). Self- Reflections and the Thesis – An important part of the notebook are the reflections and unit essay theses. These synthesize students’ work and are graded using a rubric which combines science criteria for academic vocabulary and content understanding as well as expectations taken from the essay writing expectations in the language arts common core.